Mahala Ann (Miner) Johnson was born in 1837 at Sego, Perry County, OH, the daughter of Frederick and Jane (Richardson) Miner Sr. She and her husband were pioneer settlers of Kansas. Mahala was one of three first cousins who shared the unique first name that was popular in the early to mid 1800s. The other two were Mahala (Miner) White and Mahala (Minerd) McKnight. 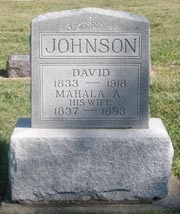 Mahala married David R. Johnson (1833-1918). His father was a native of New York, and his mother of Maryland. Their three children were Laura Catherine "Kate" Swearingen, William Albert Johnson and Lillian "Mana" Prachar Hass. The Johnsons lived at Sego for a number of years, leasing a farm from Mahala's father. David worked there as a farmer and also as a coal laborer in nearby mines. In 1871, when Mahala was 34 and providing care for her dying father, her second cousin Allen Edward Harbaugh came from Southwestern Pennsylvania and paid a visit. More than 40 years later, Harbaugh recalled this visit in a family history he had written -- Sketch of Minerd Family - Historical and Traditional -- and read aloud at the first annual Minerd Reunion at Ohiopyle, Fayette County, PA. When Mahala's father died in 1871 at age 94, the Johnsons were chosen to settle the estate. The file of probate court papers is still on file today at the Perry County Courthouse in New Lexington, OH. Once they completed the task of settling the Miner estate, Mahala and David made the major life decision to move to Kansas. In 1876, the year of our nation's centennial anniversary, they made the trek westward, settling near Concordia, Cloud County, KS. Said The Kansan newspaper of Concordia, "The family came as far as Hanover by train and the remainder of the journey was made in a wagon." The Johnsons homesteaded an 80-acre farm about seven miles southeast of Concordia, located in Section 34, Township 6, Range 3. On Feb. 17, 1885, David obtained a certificate from the General Land Office of the United States, signed by President Chester A. Arthur, conveying ownership of the tract to him. Above: the Johnson farm outlined in red, and Swearingen farms in green, south of Concordia, from a 19th century Cloud County atlas. Below: rolling foothills of the Johnson farm, to the southeast of the intersection of Milo and North 150th Roads. According to one story, David had to build a house within a certain number of days to qualify for the Homestead Act. He got the back and walls done, but time ran out. Thinking quickly, he and Mahala pulled their covered wagon in front of the structure and told officials they were cooking in the home. They succeeded in their ruse, and kept the homestead. The Concordia Weekly Empire later said that "For several years Mr. Johnson and George Scott [were] the only settlers of Centre Township." Their house was built into the side of a bank, made from natural rock found in that area of the state. The house has since been torn down. When the federal census was enumerated in 1880, Mahala and David and their three children, ranging in age from seven to 18, lived in Center Township, Cloud County. David's occupation was listed as farmer, while son William, age 13, was marked as "helps on farm." On Aug. 21, 1893, Mahala died of cancer of the bowels at age 56. 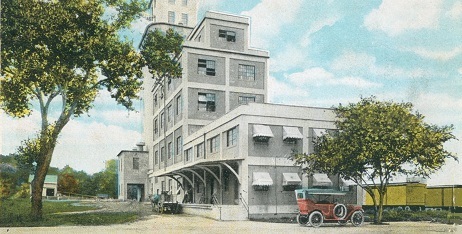 The Concordia Milling Company where locally grown wheat was ground into flour and shipped by rail to awaiting markets. David outlived his wife for more than a quarter of a century. He made his home with his daughter Lillian for many years in Center Township, as shown on the censuses of 1900 and 1910. In 1903, Lillian left home and moved to Nebraska, marrying Charles Prachar. But the marriage did not last, and by 1910, she had returned to her father's household and resumed using the name "Johnson. At the age of 85, David died on March 15, 1918. Following the funeral, held at the United Brethren Church, he was laid to eternal rest beside Mahala at the Pleasant Hill Cemetery. The Kansan newspaper of Concordia observed that "a most excellent sermon was preached by Rev. Johnson, pastor of the church. A large number of the members of the Odd Fellows lodge attended the funeral and the ritualistic services of that Order were conducted at the graveside, in the presence of a large gathering of people." Jacob Minerd [Sr.] married Mary Nein, to whom was also born Frederick Minerd, of Perry County, Ohio, who died there in May, 1871, about a week after the writer visited him. 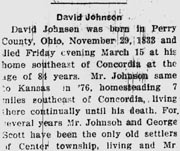 He was well advanced in years, and lived with a daughter, Mrs. David R. Johnson. I saw him fall with heart trouble in the morning. I bade all adieu, and returned six months later. Postcard sent to A.E. Harbaugh a week after the 1913 family reunion, by R.S. Minerd, inquiring about "Mrs. David R. Johnson." Just now I am deep in the systematic arrangement of the data concerning the Minerds. What can you tell me about Frederick Minerd who died in Perry Co., Ohio, in 1871? You merely mention him and his daughter, Mrs. David R. Johnson, and, to date, that is all the information I have of that branch of the family. Harbaugh's reply is not recorded, and shortly afterward Roy Minerd got married and entered medical school, which may have effectively ended their dialogue.